History required, foreign language preferred. A score of 17 points in three higher level subjects including History and preferably a foreign language, with no score lower than 5. A score of 15 points in three higher level subjects including History and preferably a foreign language, with no score lower than 5. D3,D3,M1 in three Cambridge Pre-U Principal Subjects. History required and a foreign language preferred. Studying German at UCL provides access to a broad range of subject areas, an innovative approach to learning and a rich tradition of research. Academic staff are prominent in their fields and include acknowledged experts on medieval comedy, modern German literature and film, Austrian literature, German history, linguistics and psychology. Students play an active role in the department, organising an annual German play and hosting high-profile events. Recent examples have included a summit on the future of Anglo-German relations. Resources within ten minutes' walk include the British Library, Senate House Library, the Institute for Modern Languages Research, the German Historical Institute and the Institute of Historical Research. You will also take SELCS interdepartmental modules focusing on literature, film, history and linguistics from outside your subject areas. This will enable you to focus on broad cultural movements, issues and approaches from an interdisciplinary perspective, drawing on the full range of specialisms within the school. You will spend your third year abroad in a German-speaking country: at a university, as an English language assistant within a school, or on an approved work placement. In your final year you will choose from a range of advanced options, allowing you to specialise in your own areas of interest. SELCS interdepartmental first-level modules which usally focus on literature, history, linguistics. In addition you will select 60 credits from a wide range of history modules taught in SSEES. You will spend your third year abroad in a German-speaking country. You can participate in a university placement with one of our partner universities, undertake a work placement or British Council language assistantship abroad (subject to availability/ approval), to make the most of your cultural and linguistic immersion. The experiences and skills developed while abroad further academic and personal development, cultural and social awareness, provide a foundation for further study and enhance career prospects. For further information and a list of partner universities please see the SELCS year abroad website. Teaching is delivered primarily through small seminar groups, often including individual and group presentations and small-group exercises. Lectures are less frequent, and are used to convey information which can then be discussed in small-group teaching. The programme is examined in a variety of ways: timed examinations, assessed coursework, oral presentations and examinations, and take-home papers. 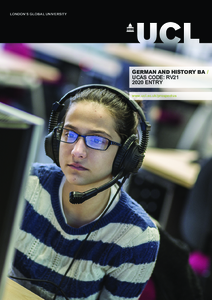 Detailed course descriptions are available on the department website: German and History BA. Thanks to a combination of intellectual training, articulacy and vocational skills, our graduates find employment in many areas of business, commerce, journalism, and law, as well as in the public sector (especially, but not exclusively, in education and culture). While a significant number of our graduates choose to remain in the UK, others spend at least part of their working lives based elsewhere, often in German-speaking countries. Recent graduates of German-related programmes have been very successful in gaining employment with companies such as Deutsche Bank, Google, the Wall Street Journal and with organisations such as the British Council. A high percentage of our graduates proceed to further study, either acquiring additional qualifications in law, journalism or business administration, or embarking on Master's or doctoral degrees (in German studies, European history, and in related areas such as translating, interpreting or international relations). In your application we will be looking for evidence of your aptitude for language learning. We will hope to discover how you became interested in history and in German language, literature, culture or society, what you are doing to further your interests, and why you wish to study these subjects at degree level. If your application demonstrates that your academic ability and motivation make you well-suited to our degree and you receive an offer, then we shall invite you to a Post Offer Open Day, where you will be able to experience the sort of teaching we offer and life in SELCS.